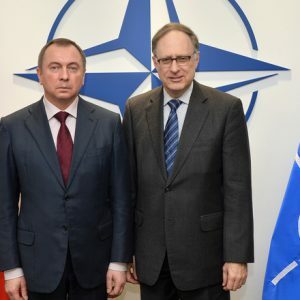 According to foreign minister Vladimir Makei, during its CSTO chairmanship Belarus will focus on positioning the organisation in the international arena and strengthening its interaction with both the UN and the OSCE. Belarus seeks to diversify its oil supplies, but refuses to mention alternative sources as long as negotiations are underway. Experts analyse the consequences of flights departing from Minsk being assigned to the international sectors of Russian airports. Moscow introduced this security measure claiming that Belarus's five-day visa-free regime threatens Russian security. Belarusian President takes part in the ‘One belt, one road' in Beijing. According to Alexander Lukashenka, this global initiative is not only reshaping the world's economic map and creating new growth points, it also represents a new type of international framework. This means integration designed to harmonise all economic institutions and remove barriers to the free movement of goods, investment, and people. At the forum, Lukashenka outlined his ideas for deepening and expanding cooperation on the Eurasian continent. In particular, Minsk suggested using the One Belt, One Road structure not only as a trading route, but also as a basis for promoting ideas and creating joint innovations. The Chinese-Belarusian Great Stone Industrial Park could serve as a model. 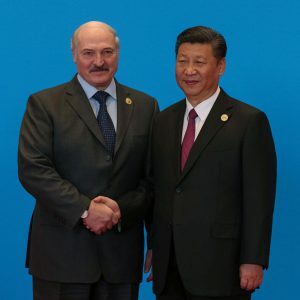 The Belarusian leader also held talks with Pakistani Prime Minister Nawaz Sharif, Turkish President Recep Tayyip Erdogan, Chairman of the People's Republic of China Xi Jinping, and Chairman of the Board of the Chinese Corporation CITIC Group Chang Zhenming, reports Belarus Segodnia. High-level Chinese officials visit Belarus. Over the past few weeks, Minsk hosted a number of high-ranking Chinese officials. Most notable was a parliamentary delegation headed by Zhang Dejiang, Chairman of the Standing Committee of the National People's Congress and the third most powerful man in the Chinese hierarchy. This level of political contact is evidence of the authenticity of the strategic partnership between the two countries, writes The Minsk Times. Currently, Belarus is implementing over 30 investment projects financed by Chinese loans, worth circa $6bn. The Great Stone Industrial Park is the largest of them. Lukashenka insists that only high-tech companies with guaranteed sales markets should become residents of the park. Currently, eight residents are registered within the park, including China Merchants Group, Huawei, and ZTE. An imbalance in Belarusian-Chinese trade, however, is raising concern within the Belarusian government. In 2016 it exceeded $2.5bn. Makei: Belarus will never abandon Russia or threaten neighbouring states. Soyuznoe Veche published quotes from Belarusian foreign minister Uladzimir Makei concerning Belarus-Russia integration. Makei is sure that integration will continue to deepen despite attempts by third parties to destroy them for profit. During its CSTO chairmanship, Belarus will attempt to strengthen the organisation's weight in the world in several areas. The first is more precise coordination of foreign policy activity. The second is stronger positioning of the CSTO in the international arena and increased interaction with the UN and the OSCE. The minister also commented on concerns from western countries regarding the upcoming military drills West 2017. Some fear Russia is preparing an attack on neighbouring states. However, Belarus has never threatened anyone and will certainly not start now. The country contributes to the stability and security of the region. Belarus seeks to diversify its oil supplies. Respublica interviewed the Chairman of the oil concern Belnaftachim, Ihar Liašenka. Over the past 20 years, the concern's production volume has tripled in dollar equivalent. The concern accounts for about 20 percent of industrial production and a third of Belarusian exports. Recently, it has experienced a difficult period due to supply shortage during the Belarus-Russia oil and gas dispute. However, it has also gained experience, which it is taking into account as it forms a long-term development strategy. Recent disagreements forced the concern to look closely at the possibility of sourcing oil from other regions. The chairman underlines that diversification is conducted not against Russia's interest, but serves as an airbag for the economic sustainability of any industry. He refused to name any country or ways Belarus could receive the alternative oil, as negotiations are underway and their content remains a trade secret. Experts analyse the consequences of flights originating from Minsk being assigned to the international sectors of Russian airports. Russians have been carrying out border control of aircraft and passengers arriving from and departing for Belarus since 15 May. Flights from Minsk have been transferred to the international sector of Russian airports. Previously they had been treated like domestic flights, writes Belarus Segodnia. Passengers will now have to show their boarding pass and ID. The Minsk airport and Belavia have made clear that how passengers will be treated in Belarus has not changed, despite new rules in Russia. Russification was the result of the industrialisation of Belarus, not Russian politics. Zviazda spoke with famous Belarusian historian and senator of the Council of the Republic Ihar Marzaliuk about the reason why nationalism failed to take hold in Belarus. Belarus is a link between East and West with inherent national and confessional tolerance. Belarus was the only country in Europe where anti-Semitism did not emerge. The Absolute Communist Supreme Council of the 11th Convocation elaborated a soft and very precise law on the revival of the Belarusian language. The entire ruling elite, understanding the delicacy and complexity of the problem, supported it. However, the nationalist faction in the council of the 12th convocation did immense harm to it, albeit in a Bolshevik manner. Russification came to Belarus not from Russia, but as a result of the industrialisation of Belarus in the postwar period. Given the multinational nature of the USSR, the intelligentsia used Russian as the language of mass communication, which was also scientifically more advanced. On 9 May in Washington, in a presentation at the American think tank Atlantic Council, Belarusian deputy foreign minister Aleh Krauchanka emphasised the importance of Belarus-US security cooperation. Meanwhile, numerous Eastern European officials from Western-alligned nations made statements about their apprehensions regarding the upcoming Russian-Belarusian West-2017 military exercises. Lithuanian president Dalia Grybauskaitė announced that West-2017 exercise is evidence that Belarus and Russia are preparing for war with the West. Minsk, however, is playing its own game and trying to get the best of both worlds. It is using the exercise to extract benefits from Russia while attempting to assure Russia's opponents of Belarus's neutrality. Who's afraid of the big bad West-2017 exercise? Latvian foreign minister Edgars Rinkēvičs stated that his country must be prepared for any outcome of West-2017, including Russian troops remaining in Belarus. The Secretary of Ukraine's National Security and Defence Council, Oleksandr Turchynov, claims that the exercise could turn out to be the preliminary stage for an offensive operation against Ukraine. Lithuanian special services warned that Russia could overrun the Baltic states in 24 to 48 hours. In April, Lithuania conducted drills in preparation for a 'Crimean scenario.' Without warning local police personnel, armed men attacked the Lithuanian town of Šalčininkai. The invaders were presented as coming from Belarus. The aggressor-country in the scenario of the drills was called Udija – clearly hinting at Belarus, which is sometimes called Gudija in Lithuanian. Interestingly, neither the local police nor the population resisted the attack, apparently unwilling to believe that Belarus could invade Lithuania. Therefore, it seems that West-2017 is worrying mostly for Eastern European politicians and special services, not so much the general population. If the [Russian] troops will be brought here, they will also smoothly leave this place again. … The troops will disembark near the exercise place, they will set up camp, there will be very few live rounds – only to shoot at targets, the rest – blank rounds. Everything's under control. Minsk would like to improve the image of the drills and make them more transparent by inviting observers and revealing details. Nevertheless, although it realises the drills are causing protests of its neighbours, it also sees them as an opportunity to solve certain issues with Russia. One item on Belarus's wish list is obtaining new and expensive equipment for the Belarusian military. This is a crucial task for Minsk, which unfortunately has no money for weapons. According to the Stockholm International Peace Research Institute, Belarusian military expenditure in 2016 has diminished by 17.5% to $597m. It is in fact possible to calculate the price Belarus has extracted from Russia for the power show: the Kremlin has had to give its Belarusian ally expensive military hardware in order to secure its cooperation. On 7 April, Lukashenka openly articulated his hopes that Russia would help him arm the Belarusian armed forces: either at Russia's expense, or 'for a small price.' In particular, Lukashenka wanted to finally acquire the Su-30 fighter jets over which Minsk has been wrangling with Moscow for more than a decade. According to Lukashenka, he recently discussed the issue with Putin, who "jumped up" after hearing of Belarusian appetites. The Belarusian leader offered to pay him half-price (despite the fact that each airplane costs about $25m) and apparently prevailed. Shortly after, various Belarusian military officials started speaking about receiving the new aircraft as soon as 2017. That is certainly not all. In a related development, twelve new military transport helicopters (Mi-8MTV-5) were delivered to Belarus by the Russian corporation Vertolyoty Rossii in two instalments in November and March: months earlier than expected. Minsk has few other reasons to participate in this show of power called West-2017. Although these exercises are clearly a move by the Kremlin in its ongoing confrontation with the West, the Belarusian government simply keeps its distance from such conflict. Speaking in Washington on 9 May, Belarusian deputy foreign minister Krauchanka emphasised that Minsk 'does not regard NATO presence as a direct threat to Belarus, although this undoubtedly creates risk and security challenges in the region.' The Belarusian government considers the rising tensions in Europe to be 'the biggest threat' to its national security. Krauchanka was not the only Belarusian official to express this position. Defence minister Andrei Raukou, in a rather militant presentation at the Fourth Moscow International Security Conference, lashed out at new NATO deployments and stored military hardware. Given the conference venue, such statements come as no surprise. Nevertheless, he stated that for Belarus, NATO's eastward expansion was a fait accompli. We are alarmed by such actions also because of the recent increase in militant rhetoric between East and West. I will not say who is right, who is to blame. But … these accusations are not always justified. Likewise, Minsk is trying to increase its security cooperation with the West. Deputy foreign minister Krauchanka, during his latest visit to the US, called security cooperation 'a cornerstone' in Belarus-US relations. As examples, he cited Belarus's provision of land transit to supply NATO forces in Afghanistan. US sanctions against Belarus notwithstanding, 'when America needed our help, we provided it. Moreover, we did it consciously, never tried to bargain, and even avoided speaking publicly about it.' Krauchanka failed to specify further plans for cooperation, but under the current tense circumstances in Eastern Europe, Minsk could play an important role in various international projects beyond mediating in the Russian-Ukrainian conflict. Thus, the Belarusian position could become important should the US attempt to raise the issue of Russia's possible violation of the Intermediate-Range Nuclear Forces Treaty. This possibility follows from an interview with Rose Gottemoeller, former US Under Secretary of State and the current Deputy Secretary General of NATO, published on 3 April by the Russian daily Kommersant. She underlines that the possible violation could be discussed not only with Russia, but also with other parties, i.e., Belarus, Kazakhstan, and Ukraine. 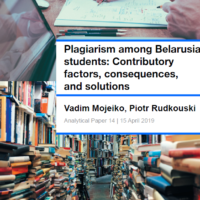 It would behove the Belarusian government to build a more balanced and neutral policy by establishing more diversified partnerships in the security realm. At the same time, Minsk realises the sensitiveness of this issue for Moscow, and agrees to what is most important to the Russian leadership, such as the forthcoming West-2017 exercises. This, however, does not mean that the Kremlin can dictate whatever it wants. On the contrary, Belarus is reshaping its national security policies and can still persuade Russia to help it with military equipment.